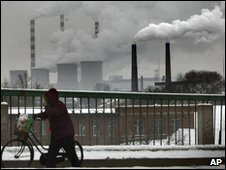 An Australian firm has signed a $60bn (AUS$69bn; £38bn) deal to supply coal to Chinese power stations. Clive Palmer, chairman of the company, Resourcehouse, said it was Australia's "biggest ever export contract". Under the deal, the firm will build a new mining complex to give China Power International Development (CPI) 30m tonnes of coal a year for 20 years. Analysts say it is further evidence of China's strong demand for resources boosting Australia's economy. Most of China's power stations rely on coal - and demand has risen sharply in recent months after a government stimulus programme re-energised its economy. The plan involves building a huge new mining complex in the Australian state of Queensland, and laying 500km (311 miles) of railway line to move the coal to the coast. Resourcehouse's executive director, Phil McNamara, said the "once-in-a-century project" would include open-cast and underground mines, with construction likely to begin later this year. The complex in the Galilee basin, to be called China First, is expected to start coal production in 2013 and will churn out some 40 million tonnes a year. Queensland state premier Anna Bligh anticipates the project will create tens of thousands of jobs and produce multi-million dollar royalty payments for the state government. But the lucrative Sino-Australian deal will almost certainly disappoint some environmental groups, says the BBC's Phil Mercer in Sydney. They believe Australia's reliance on plentiful reserves of coal, both for domestic electricity generation and for export, should be reduced in favour of renewable sources of energy. Analysts say the deal signals a thaw between the two nations, following a string of incidents in 2009 that strained relations, from the arrest in Shanghai of an Australian mining executive from Rio Tinto to the high-profile visit to Australia of Uihgur activist leader Rebiya Kadeer. An attempt by the state-owned resources company, Chinalco, to buy into the Anglo-Australia mining giant, Rio Tinto, also ended in acrimony.